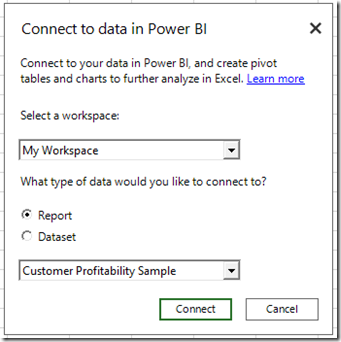 Since its release last march, it’s possible to analyze Power BI from excel. Now Microsoft had added a new feature that brought new meaning to the term better together that Power BI and Excel are working hard to achieve. How change the Use of Excel on power bi? After installing the July update of Power BI publisher for Excel, open Excel and go to the Power BI ribbon tab. Click Connect to Data (you’ll need to sign in to Power BI first). After you select the workspace, and the report or dataset, just press the Connect button and that’s it! You’re ready to analyze with a pivot table connected to your data in Power BI.